Filorga Light Peel (sensitive skin) is a chemical peel specially formulated for sensitive skin to diminish the appearance of aging signs. Infused with gentle yet potent ingredients such as gluconolactone and mandelic acid, it adds radiance to dull skin for a younger-looking complexion. 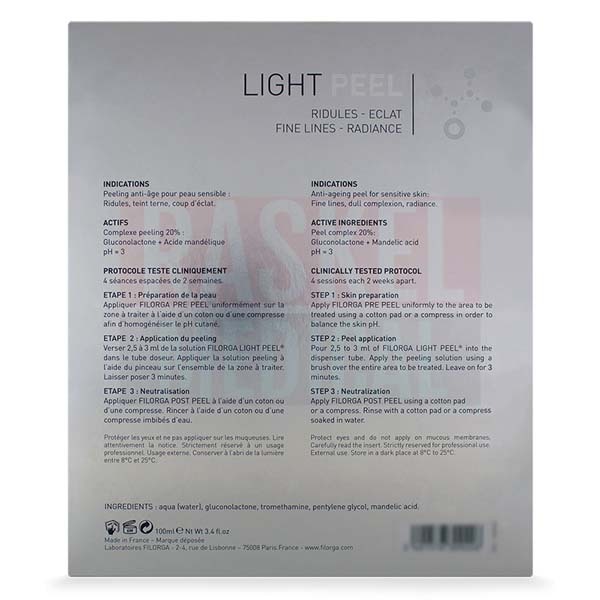 Developed by Laboratories Filorga, the high-performance chemical peel is manufactured in France. 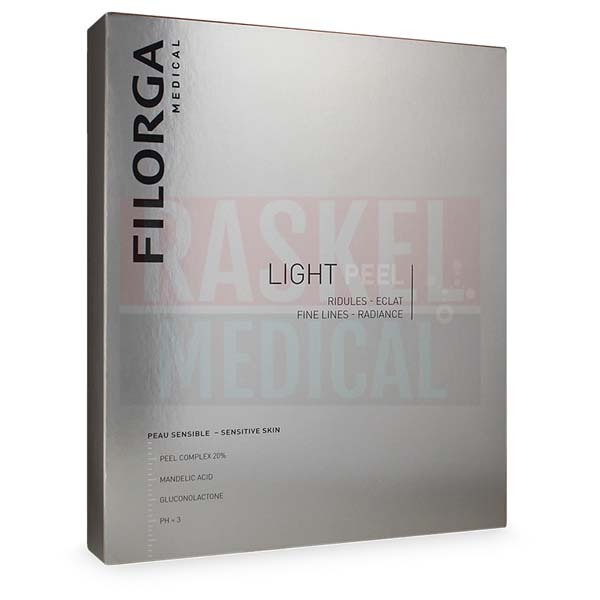 Filorga Light Peel (sensitive skin) is mainly used to combat aging signs such as lines and wrinkles. Formulated with mandelic acid, this product exfoliates damaged skin to promote regeneration of skin cells, thereby revealing brighter complexion. Mandelic acid, which is keratolytic in nature, is well-tolerated by most patients with sensitive skin. Mandelic acid is able to add radiance to skin for dramatically younger-looking skin. Filorga Light Peel (sensitive skin) is manufactured by Laboratories Filorga SA. Having 35 years of expertise in aesthetic medicine, Laboratories Filorga SA offers a wide range of aesthetic treatments such as phototherapy, mesotherapy and dermal fillers. In addition, Laboratories Filorga SA also develops and manufactures highly effective skincare using innovative technology. Distributed in more than 60 countries, the brand’s highly effective aesthetic treatments are available in salons, pharmacies and clinics around the world. Filorga Light Peel (sensitive skin) is manufactured in France. Filorga Light Peel (sensitive skin) may occasionally cause adverse reactions such as itching, erythema, skin flaking and edema. As well, avoid sun exposure for two days after treatment and wear a sunscreen. Prior to treatment, apply prepping product such as Pre-Peel to treatment area using a cotton pad. This is to restore the skin’s pH balance. After dispensing 2.5 to 3ml of peeling solution into the tube, apply it to designated area using a brush. Then wait for around three minutes to allow the complete absorption of peeling solution. After that, use a cotton pad to apply Post Peel on treated area. This helps to neutralize the acids in peeling solution. Peeling treatments should be repeated at a two-week interval. A total of four treatment sessions are recommended. Filorga Light Peel (sensitive skin) is formulated using potent ingredients such as mandelic acid and gluconolactone. Due to its larger molecular size, mandelic acid does not penetrate into the skin as deeply as other acids, making it ideal for inflammation-prone sensitive skin. Sourced from bitter almonds, mandelic acid has powerful brightening and anti-inflammatory effects on skin. Gluconolactone in the chemical peel is sourced from glucose through the process of bio-oxidation. Due to its unique chemical structure, gluconolactone demonstrates strong keratolytic properties. Despite having similar efficacy to conventional alpha hydroxy acids, gluconolactone is better-tolerated by patients with sensitive skin. The anti-aging effects of Filorga Light Peel (sensitive skin) are long lasting but not permanent. Maintenance treatments will be needed to preserve the results. 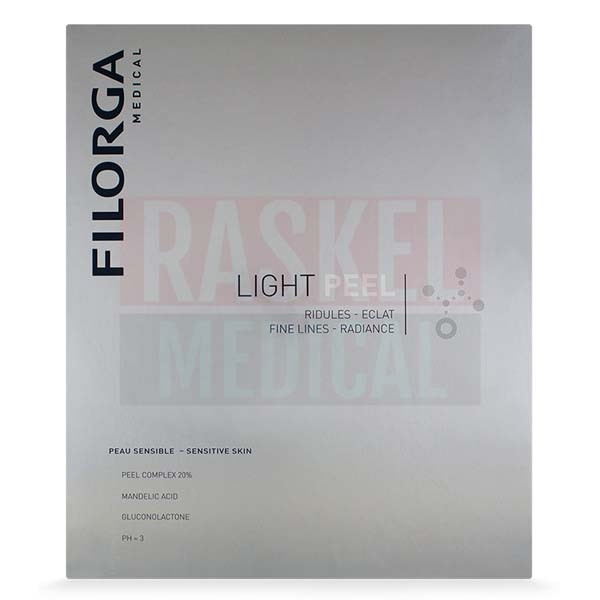 Filorga Light Peel (sensitive skin) should be stored in cool, dark place. Ideally the chemical should be kept at 8 to 25°C. Please refer to the expiry date on the package.